Cornerstone: The Rasp by Philip MacDonald. I thought I would devote part of this summer to catching up on the books I've missed on the Haycraft-Queen Cornerstone list---those mysteries published between 1748 and 1952 that were deemed essential by Howard Haycraft and Frederic Dannay. To date, I've read 34 works on the list. I've been intrigued by the work of Scottish writer Philip MacDonald (1899-1981) since I saw the 1956 film Twenty-Three Paces to Baker Street (which features Van Johnson as a blind playwright who overhears a kidnapping plot). MacDonald, grandson of writer George MacDonald, is probably best known for the Edgar-nominated The List of Adrian Messenger (1959), but two of his other works appear on the Cornerstone list: The Rasp (1924) and The Nursemaid Who Disappeared (aka Warrant for X, 1938, the basis for Twenty-Three Paces to Baker Street). The Rasp introduces the "hawky" Anthony Ruthven Gethryn, a former WWI secret agent, who looks into the murder of a cabinet minister. The hulking secretary is arrested, as his fingerprints were found on the murder weapon (a wood-rasp, a tool used in furniture making), and the grandfather clock was obligingly stopped to provide the time of the murder. Or does it? Gethryn is suspicious of the obvious clues. The book poses some challenges for the modern reader, in a lengthy chapter of exposition as Gethryn explains his process for uncovering the murderer, and in the portrayal of two female characters who are presented as the epitome of competence until relatively minor circumstances cause them to change into quivering blobs of gelatin, and the male characters pat them on their collective heads. However, Gethryn is more than a dilettante amateur detective; hints of nasty goings-on during the war point to a need to atone through private investigation, while phrases such as "some cold, dark beastliness brooded everywhere" show an awareness of the dirtiness of the job. MacDonald has a facility for the well-turned phrase and a healthy sense of humor, as seen in the description of the newspaper editor Hastings as "looking, as a woman once said of him, rather like a stalwart and handsome chicken." MacDonald once said, "The ideal detective story is a sort of competition between the author and the reader." I have to admit that I guessed the perpetrator, but the character of Gethryn, the dissection of the seemingly open-and-shut case, and some sudden turns make The Rasp an enjoyable read. Master British spy novelist Eric Ambler was born today in 1909. He died in 1998. Thankfully, much of his work has been reissued in trade paperback by Vintage Crime/Black Lizard, including Background to Danger, Cause for Alarm, A Coffin for Dimitrios, Epitaph for a Spy, Journey into Fear, Judgment on Deltchev, The Light of Day, The Schirmer Inheritance, and State of Siege. His screen work includes the 1960 TV series Checkmate and screenplays for The Cruel Sea (1952), A Night to Remember (1958), and several of his own books. Photo: Orson Welles (on the right) in the film version of Journey into Fear (1943). Dorothy Gilman, creator of intrepid elderly spy Mrs. Emily Pollifax, turns 84 today. 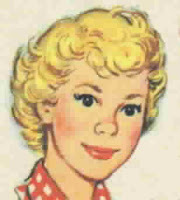 Gilman began her career as a children's author, publishing The Enchanted Caravan in 1949. The Unexpected Mrs. Pollifax, in which the widow from New Brunswick, NJ, chucks her garden club and volunteer work to join the CIA, appeared in 1966. The most recent book in the series is Mrs. Pollifax Unveiled (2000). There have been two adaptations for the screen: Mrs. Pollifax, Spy, with Rosalind Russell (1971), and The Unexpected Mrs. Pollifax, with Angela Lansbury (1999). Another classic and hilarious work by Gilman is A Nun in the Closet, in which nuns discover a man on the lam and various other skullduggery in a house they have inherited. MWA Grand Master Lawrence Block, the creator of smart-aleck burglar Bernie Rhodenbarr, detective Matt Scudder, hit man Keller, and spy Evan Tanner, turns 69 today. Among his latest releases is Lucky at Cards from Hard Case Crime with a con artist and card shark who becomes enmeshed in murder. My World War I story, "No Man's Land," appeared in Blood on Their Hands, the MWA anthology edited by Block. I still sorely miss his column on fiction writing in Writer's Digest, which he penned for some 17 years and often featured the entertaining Arnold, his perpetually dim fictional student. Few of his longtime readers forget how he encouraged us to go hang around in bars to pick up authentic dialogue. Block's sage writing advice can be found in his books Spider, Spin Me a Web; Writing the Novel from Plot to Print; and Telling Lies for Fun and Profit. Evelyn and All the Waughs. I'm fascinated by literary families. Is there something in the familial soup that leads its members to turn to writing careers? Look at the Longfords (mother and biographer Elizabeth; sisters and novelists Antonia Fraser and Rachel Billington; brother and nonfiction writer Thomas Pakenham). Or the staggeringly talented Cockburns (father Claud; brothers Alexander, Andrew, and Patrick; late and sorely missed half-sister and mystery author Sarah Caudwell; nieces and broadcast journalists Laura and Stephanie Flanders). I try not to hold it against the Cockburns that their ancestor torched the White House during the War of 1812. Now there's Fathers and Sons, a new book about the Cockburns' cousins Arthur, Evelyn, Alec, Auberon, and other assorted Waughs and their impact on "the family business"---ie, the literary world. It's written by Alexander, Auberon's son and Evelyn's grandson. The book traces the Waugh line from the Victorian doctor Alexander Waugh (nicknamed "The Brute" with good reason); to Arthur, a mainstay of the publishing firm Chapman and Hall; to Arthur's novelist sons Alec and Evelyn; to journalist Auberon and beyond. It goes a long way toward explaining Evelyn's waspish personality, including debilitating bouts of depression, that stemmed from his thorny relationship with his father. It also features Alec's generous acknowledgment of Evelyn as the superior writer and an entertaining bit about Auberon's probable culpability in the burning down of his prep school. A cautionary note: many escapades with men, women, and--er, other creatures--are covered, so this book is not for the faint-hearted. With the discussion of the decline of newspaper book reviews; a book by Gail Pool, Faint Praise: The Plight of Book Reviewing in America, coming out at the end of the month; and as someone who writes occasional reviews herself, I watched the Book Expo panel on ethics in book reviewing with keen interest, not the least for its lineup of panelists: perpetual enfant terrible Christopher Hitchens, Francine Prose, NYTBR's Sam Tanenhaus, the Philadelphia Inquirer's Carlin Romano, the LA Times's David Ulin, and, my personal favorite, John Leonard of the Nation, who used to do socko reviews for CBS Sunday Morning. The panelists dealt with the large, knotty problems of reviewing: should one review friends' books, should papers print responses to reviews, do negative reviews serve a purpose (with Leonard especially eloquent on the topic of reviews as "performance art"), and so forth. I believe Book TV will rebroadcast the program on June 16th, or you can catch the footage here. One of the best reviewers in the business, in my opinion, is Edgar winner Jon L. Breen of EQMM and Mystery Scene. Jon can tell you in 50 beautifully composed words whether a book is worth your time or not. I aspire to his standard. Happy birthday, M. C. Beaton. Happy 71st birthday to Scottish mystery writer M. C. Beaton, creator of constable Hamish Macbeth, who is based in eccentric Scottish village Lochdubh, and the cantankerous sleuth Agatha Raisin. Beaton's alter ego is prolific romance author Marion Chesney, who also pens an Edwardian mystery series for St. Martin's that includes Snobbery with Violence. Hamish did take a turn on the TV screen, but I prefer the audiobooks narrated by Davina Porter, as they well capture the lively oddities of small-town life. Coming next for Agatha Raisin in August is Love, Lies, and Liquor, in which guests at a seaside hotel keep turning into corpses. Sara Paretsky, creator of groundbreaking private investigator V. I. Warshawski, turns 60 today. I've already posted here regarding the winter 2007 Clues issue on Paretsky and her February Library of Congress lecture on the occasion of V.I. 's 25th anniversary. A new collection of nonfiction essays, Writing in an Age of Silence, has been published by Verso; more here about that. E. W. Hornung, creator of gentleman thief Raffles and the brother-in-law of Arthur Conan Doyle, was born on June 7, 1866. He died in 1921. Conan Doyle called him "a Dr. Johnson without the learning but with a finer wit" (Memories and Adventures 252). Hornung punned that "[...t]hough he might be more humble, there is no police like Holmes" (ibid.). After Hornung's death, Barry Perowne continued the Raffles series, and Graham Greene wrote a play, The Return of A. J. Raffles, that starred Denholm Elliott. 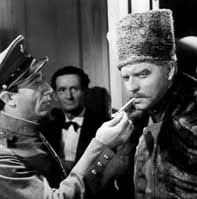 On film, both Ronald Colman (1930) and David Niven (1939) played the amateur cracksman, but the photo above shows Anthony Valentine in a 1975 British production now on DVD. There are also new Raffles radio programs available from Jim French Productions. I was always terribly fond of Bunny Manders, Raffles's loyal if sometimes hapless sidekick. Happy birthday, Julie Campbell Tatham. 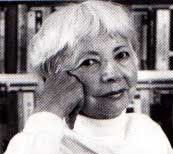 Julie Campbell Tatham, creator of girl sleuths Trixie Belden and Ginny Gordon, and writer of several of the Cherry Ames and Vicki Barr mysteries, would have been 99 today (she died in 1999). Trixie and Ginny made their debuts in 1948, in The Secret of the Mansion and Ginny Gordon and the Mystery of the Disappearing Candlesticks, respectively. Tatham attended one of the early Malice Domestic conventions, where her panel was standing room only, and many fans had the opportunity to tell her how much pleasure her books had given them. She was a delightful and modest lady. BTW, a future issue of CLUES: A Journal of Detection will focus on the girl sleuth. Read the Call for Papers here.